This SAR Class 19D No 2690 locomotive was built in 1938 by Borsig as works no 14741. Before WW II, 135 engines of Class 19D were delivered by Krupp, Borsig and Skoda. Immediately after the war, a further 50 Class 19D's were supplied by Robert Stephenson and Hawthorn Ltd. These were similar to the pre-war 19D, except they were fitted with vacuum brakes. The final order of 50 engines of this class was from North British Locomotive Co in 1949 and fitted with a new type of tender known as the Vanderbilt as mention above. Unknown date. Photo by Hennie Heymans. The 19D plinthed in Wakkerstroom has a so-called "Vanderbilt" tender which has a cylindrical water tank and six-wheeled "Buckeye" bogies. In 1901, Cornelius Vanderbilt III, whose great-grandfather founded the New York Central Railroad, invented a cylindrical tender which was soon adopted by a number of American railroads with oil-burning locomotives. Compared to rectangular tenders, cylindrical Vanderbilt tenders were stronger, lighter, and held more fuel in relation to surface area. 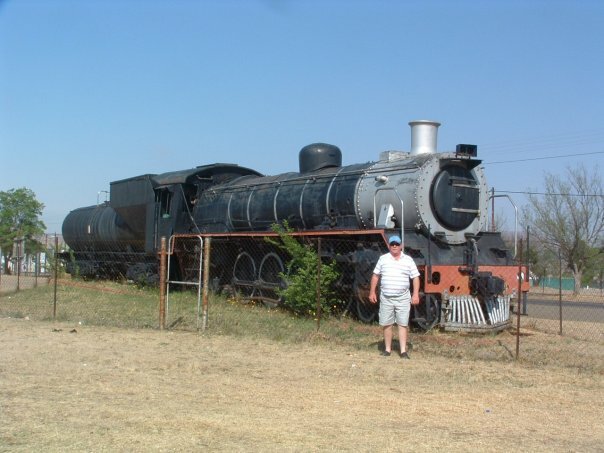 In South Africa the design was used to carry water & coal for the locomotive. They've got a sponsorship to buy paint for this loco (perhaps as part of the 150 year town celebrations). Now they're looking for somebody to sponsor labour for the repaint.